Kazimierz Karabasz, creator of the Polish school of documentary filmmaking and an outstanding director, died at the age of 88. Kazimierz Karabasz was born in 1930 in Bydgoszcz. He was a documentary film director who graduated from the Film Direction Department at the Łódź Film School. Between 1956-1990 he worked as a director in the Documentary Film Studio in Warsaw. He made around 50 documentary films including: “The Musicians”, “People on the Road”, “Encounters”, “A Year in the Life of Franek W.” or “The First Step” and was among the creators of “the Polish school of documentary filmmaking”. He directed four feature films and several pieces for the Television Theatre. The member of Kronika Film Studio and the Akademie der Künste (Academy of Arts) in Berlin. The author of books about the documentary technique: “Cierpliwe oko” (The Patient Eye), “Bez fikcji” (No Fiction), “Odczytać czas” (Reading the Time) and “Rozmowa o dokumencie” (A Conversation on Documentary Films). For many years he has been teaching at the Łódź Film School and educating numerous generations of Polish documentary filmmakers – between 1982-87 he was the dean of the Film Direction Department and since 2000 a head of the Documentary Film Institute. A year ago the School granted him the Doctor Honoris Causa Degree. The winner of numerous awards at international and national festivals. His film “The Musicians” (1960) was awarded at the first edition of the Krakow Film Festival, won Syrenka Warszawska Award (Warsaw Marmaid) as well as awards at festivals in Leipzig, Tours, Venice, Mexico City, Oberhausen, San Francisco. In 2006 at the Krakow Film Festival he received the Dragon of Dragons Award. 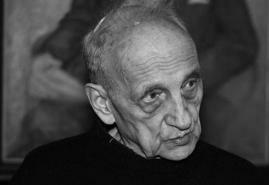 Kazimierz Karabasz died on August 11th in Warsaw.